In our last post we discussed then (plain old) Bradley, now Sir Bradley Wiggins performance at last years Tour of Britain. In what should have been a valedictory event for the 2012 Tour de France and Olympic time trial winner, the Sky rider instead abandoned the race at the halfway point after a bizarre performance during which time he turned round and rode back the way he came in search of teammate Mark Cavendish. Wiggins stated aim this season, to win the Giro d’Italia, had looked in doubt from the outset as the Wigan based rider was unable to repeat his imperious form of the previous year and he often struggled to make the top five on GC in his preparation events like the Giro de Trentino. 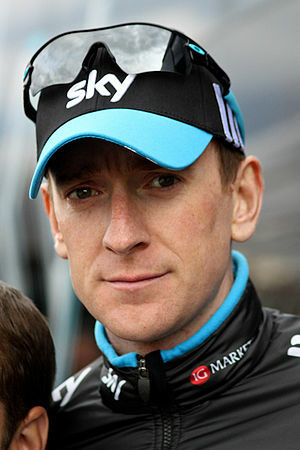 Wiggins hopes in the Giro went down the drain with the heavy rainfall that was such a feature at the event. A seemingly innocuous crash in the first week seemed to damage his confidence and he withdrew before the race finished. Pre Giro there had also been the debate, often fueled by Wiggins, about leadership of the Sky team at this years Tour de France. His performance at the Giro was probably the confirmation that the Sky hierarchy needed that Chris Froome, as well as being more suited to the parcours, was now the number one rider at the team. And so it was a different Bradley Wiggins that emerged from the aftermath of Team Sky’s celebration of a second successive Tour win, making a low key return a week after the Grand Boucle in the Tour of Poland. He was entered in this event to target the individual time trial stage, pitching himself against one of his chief rivals for the world TT championships. Interviewed in the build up to the race the world’s TT was held up as the now 10kg heavier Wiggins goals for the end of season. And there, quietly in the background, was the announcement that in addition to the individual test, he would lead Sky at this years Tour of Britain and it was a race he intended to win. There has been some critical mass building to Wiggins performance in last weeks race. His actual race form hadn’t sparkled after winning the stage in Poland, but he was finishing races and becoming a decent interviewee again. It can’t have been easy for Wiggins to admit that the reason he didn’t call Chris Froome to congratulate him in Paris was his fault as he didn’t have his mobile number. Both Wiggins and Sky had kept things low key when commenting on his participation in Poland and the following Eneco Tour, but as far as his home race was concerned the talk was of targeting the GC. Perhaps critically here, in addition to a strong supporting line up including Stannard, Eisel and Lopez, Shane Sutton was back in the fold after early season announcements that he would no longer play an active role in the Sky set up. The first couple of stages held in typically wet British weather had been a sprinters party, despite an uphill finish on stage 2 in the Lake District. Milan San Remo winner Gerald Ciolek would have been reminded of the weather on the Italian coast earlier this year as he overhauled An Post’s Sam Bennett to win and take over the leaders gold jersey. Sky had kept Wiggins protected and near the front for these stages and there was a suggestion that he was in for the long haul when even he admitted that he “..would have climbed off” because of the conditions if he wasn’t motivated for the overall. Confirmation of this came the following day when Wiggins made several runs around the TT course at Knowsley. Tellingly rival Alex Dowsett, getting over a cold, chose to reconoittre the route from his team car. Dowsett was out of the starting hut before Wiggins, but any contest with his Sky rival was soon made academic as other riders went faster. Wiggins, the only rider to break 20 minutes for the test, was into the lead. The following day brought the first of three stage wins for Mark Cavendish. Sunday’s misfire of the Omega Pharma sprint train was forgotten as the world tour teams began to impose themselves on the peloton. Another world tour squad were making their presence felt in the other competitions. Movistar’s Angel Madrasso was a permanent fixture in the breaks all week and thanks to an infringement on the final stage was able to claim both the KOM and sprinters prizes. For the smaller teams the pickings were pretty slim. The chance to feature in the break or a bunch sprint was the best that most could hope for. With talk of the ToB moving up to HC status in the future many of the British squads will feel disappointed that they didn’t come away with a better result. There would have been mixed feelings among the 3rd level teams at Simon Yates stage win on Dartmoor. The British U23 squad had appeared the previous year, but Yate’s win following both his and his twin brothers performances in the Tour de Avenir will have put both riders first in the queue for a contract with the world tour squads. The emphasis on shorter criterium style events seems to blunt the opportunity for some of the young riders in the British conti squads to shine. Despite the bad weather earlier in the week, crowds at this years race if anything seemed even bigger than the year before. Certainly the final stage around central London had a last day of the Tour feel and Cavendish served up the perfect result, winning convincingly. Wiggins was lost in the bunch over the line, but maintained a comfortable lead at the finish. Both riders had demonstrated their respect for the race in interviews all week, Cavendish showing his pride at winning the final stage at his home race and Wiggins describing that there are “..no easy stages on the Tour of Britain” earlier in the week. Inevitably, talk is already turning to what will Wiggins do next. The rider is focused on the world championship time trial, what comes next will be interesting. A stated aim is to win another gold medal at the Olympics in 2016. That still leaves at least one season where, perhaps, Wiggins will target another race with ‘history’. Paris Roubaix perhaps? We will be sharing our fans eye view of the penultimate stage from Epsom to Guildford shortly. Don’t forget to visit our Facebook page where you can bid for a T shirt signed by Tour of Britain legends including Tour de France 2013 stage winner Dan Martin! Omega Pharma successfully defended the TTT title in Florence on Sunday. Sky, denuded of Wiggins due to the ToB still managed to take 3rd place reinforcing their reputation as one of the strongest TTT outfits. Runners up were winners of the TTT at this years Tour Orica Greenedge. The women’s TTT was also defended successfully with Specialized Lululemon taking the win. No domestic broadcasters are taking the live pictures from the event, so you will need to check out UCI TV for live streaming. In addition to the loss of Vacansoleil it was rumoured over the weekend that second tier French outfit Sojasun would also be folding due to a lack of sponsorship for 2014. VCSE had reported the apparent saving of Euskatel by Fernando Alonso a couple of weeks back, but both parties have officially announced that they were unable to reach agreement on the structure of the team for 2014. Alonso has vowed to build a team from scratch which suggests that he still intends to pursue a world tour licence. However, he is suggesting that this team will not appear until 2015 at the earliest so there will be a lot more Spanish and French riders looking for rides next year. Expect to see a lot of animation from these riders at the worlds and at the Giro di Lombardia as they look to catch the eye of a prospective employer.